Its time for my monthly book round up again. 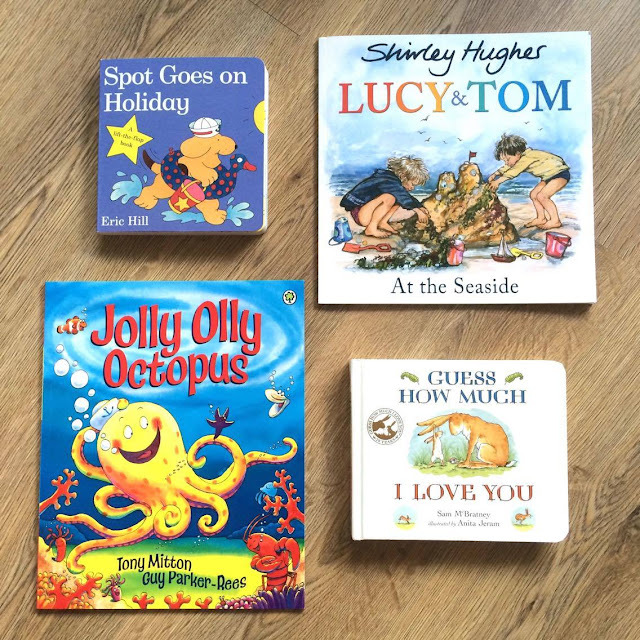 Each month I write about new books that I have introduced to Lily at bedtime and what we think of them. We always read around 4 books a night and most nights we end up reading the same ones. Lily has been a little tricky to read to recently as she now knows story time means bedtime and doesn't actually want to go to bed. You can read all our other monthly roundups here. This month I wanted a slight theme to them seen as we were going on holiday. I did search everywhere for some decent holiday stories but found they were a little tricky to find. In the end I found some. Spot has always been a classic favourite of mine. I know I loved spot as a child and so I thought Lily would love it to. She definetly did. I was so pleased to find a Spot holiday themed book and the story shows all about what Spot gets up to while he is there. It has the usual lift flaps which Lily loves to lift up. The only thing that was a issue with the book was that there was no flap on the last page and so when it came to the last page she was feeling around everywhere for a flap and getting very frustrated that there wasn't one. Other than that, we loved this book. I bought this book from Amazon. I really wanted a story for Lily which was about a classic seaside holiday as that is just what we were going to be having. When I found this one I really had hit the story book jackpot. You really can't get more classic seaside than this story. It has all about the sea, the beach, building sandcastles and splashing in the sea. Then there is also eating ice cream, having picnics and going on donkeys. I loved reading this story to Lily as it really reminded me about all my trips as a child to the seaside. I was a little worried Lily would be bored as there was no rhyming in it or cartoony illustrations but she proved to me that you can't beat a classic story as she loved it. I found this book on Amazon. When I first started to read this story I was a little tongue tied with some of the rhyming with a lot of the words all starting with the same letter. But after reading it a few times I started to get used to it and its really nice to read when you can read it fluently. The story is a fun underwater counting story featuring lots of different sea creatures. Its all about laughter and It teaches children to count to 10 while hearing a fun story about being under the sea. Lily enjoyed part of the story where it mentioned ticking and then she started to tickle all the sea creatures on the page. This story got her quite excited so we started to read this one first to get the excitement out of the way. The illustrations are brilliant and lovely and colourful. I found this story in The Works. This wouldn't be the first time I have read this one to Lily as I read it lots of times when she was a baby. But with this months selection being so exciting I decided to get it back out again to have a nice calming story to read last. Lily loves this story. Its such a sweet story of baby and daddy rabbit talking about how much they love each other and the baby rabbit is always trying to find a way to show how much he loves his daddy. The story ends with the famous line. "I Love you to the moon and back" which is such a nice story ending. Its the perfect bedtime story to relax your child and help them become ready for sleep. I got the book bought for me from a friend when Lily was little but you can pick it up in most high street book stores such as WH smith or Waterstones. Which story do you like the sound of the most? OOH I don't think we've read any of these :D I should get some Spot books - I love Spot! This week has been mad with work, blog and life in general! I wish I had time for more reading for me and little ones! Spot goes on holiday sounds like a good read. I am impressed to see Spot is still doing the rounds and still doesnt look any older! All four books sound really good. I love Spot the Dog books. Found when I worked in a children's nursery, that the children loved Spot the Dog books. Can understand, and relate to Lily in regards to flap books ( as always exciting, finding out what is hiding under the flap. Appeals to our natural sense of Adventure). Guess How Much I Love You :- Wonderful, as we need to know that we are loved. Also good to encourage children to know that it is ok (nice) to let others know that they are loved (e.g. mum, Dad, Grandparents, Aunt, Uncle, etc). Seems to encourage children to confide in a loving parent. Jolly Olly Octopus :- Cover really bright and inviting / interesting. Book sounds great, love the rhyming aspect. Lucy and Tom at the Seaside :- Sounds like a lovely book for children.